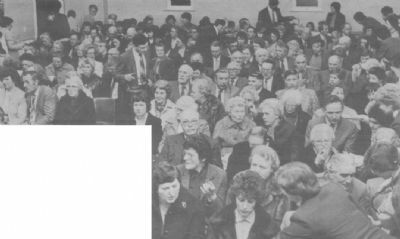 Lissara’s 118 year old Presbyterian Church was officially re-opened in 1985 after the completion of £40,000 renovations. A large congregation packed into the church on Thursday to hear Rev. 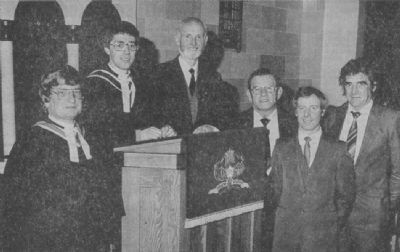 James Lamont, former minister of First Ballynahinch Presbyterian Church, and now minister of Regent Street Church, Newtownards, perform the opening ceremony. The renovation work has taken over five months to complete and since then the congregation has been meeting in the adjoining church hall for services. Now with the work completed the congregation, whose minister is Rev. Uel Armstrong, are back in ornate surroundings of this unique church. 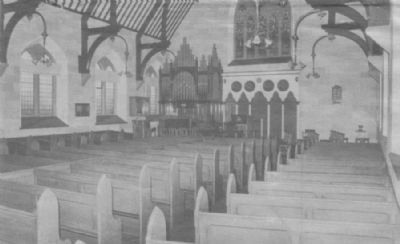 The front of the church has been completely redesigned, with a new pulpit and Gothic plasterwork just underneath the huge stained glass window which was installed in 1937. New look pews, they have been stripped to the bare wood and repainted, held their first worshippers on Thursday, and the Memorial organ was in top class form after being repainted and overhauled. There is a unique look to the walls of the church which has been painted in green, pink, stone and beige. In fact the painting work was carried out by someone very Close to the church, Mr Robert Dickson, Captain of Lissara Boys Brigade Company, and convenor of the Property Committee. The architect was Mr Gordon McKnight, and the work was mainly supervised by Rev. Armstrong, Jack McMillan, Raymond Rodgers and the church committee.